Artist Noah DiRuzza represents the environment's emotions in textures and colors. 'Surface Tension' has holes burned into the canvas. 'Lost and Found' features pieces of a discarded motor. Notes of mountains, oceans and deep-space are captured in a new abstract painting exhibit at Stark State College. On this week's State of the Arts, we talk with painter Noah DiRuzza about his process and how he tries to represent the environment's emotions through his work. There's a lot to take in with Noah DiRuzza's work. His paintings are smeared with so much oil and acrylic paint that they need to be viewed from multiple angles to see all the peaks, cracks and crevices. He calls them "sculpture-esque-hybrid paintings." "I don’t try to make anything in particular, they just become what they want to," he said as we walk through his show on the second floor of the busy student center at Stark State. DiRuzza, whose day job is in home improvement, uses found objects like steel wool, chicken wire and even layers of plastic bags. 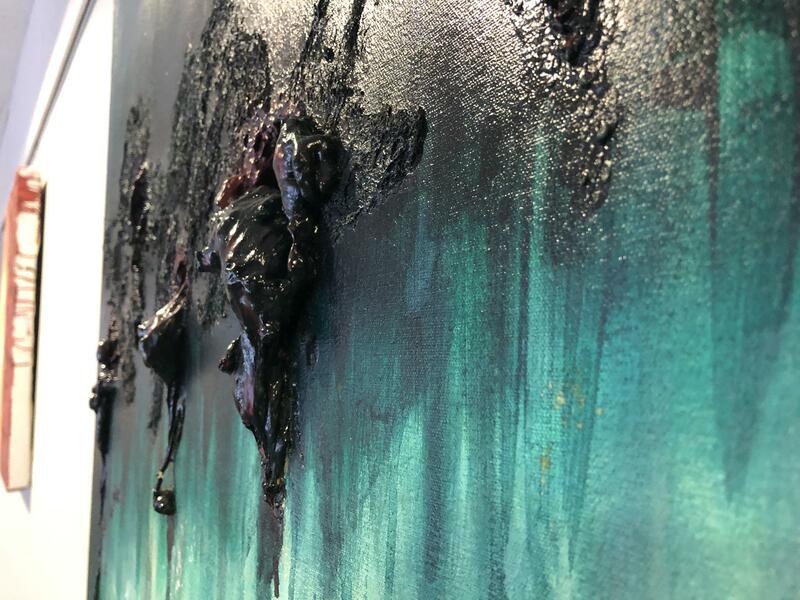 He said his paintings represent different ways humans have affected the environment by capturing "the emotion of the planet just using colors and textures." Some paintings look like a bird's-eye view of polluted waterways, while others use warm primary colors and wire reminiscent of honeycomb. DiRuzza has even burned holes in a few canvases. He said he kept a fire extinquisher at the ready if things went wrong. It makes his paintings look as if acid has burned its way through them. "It's just a lot of process of trial and error and testing. It’s like the fun part of my pieces I just experimenting and having fun." And DiRuzza experiments quite a bit. He found a discarded motor from an unknown machine, took it apart and made it the centerpiece of a work called "Lost and Found." The brown pieces of metal overlay a bright blue gradient of acrylic paint. "It just represents like scrap that we throw in the ocean. It falls in the bottom and it’s there forever." DiRuzza also experimented with chemical reactions. Over the course of several days, he sprayed paint stripper onto painted wood. "The viscosity of the paint changed so I had to cover them in this epoxy resin to kind of seal it," he said. The effect looks almost like smooth marble or granite. But maybe the most striking work in the show is a six-canvas series that showcases much of DiRuzza's skills in one cohesive work. 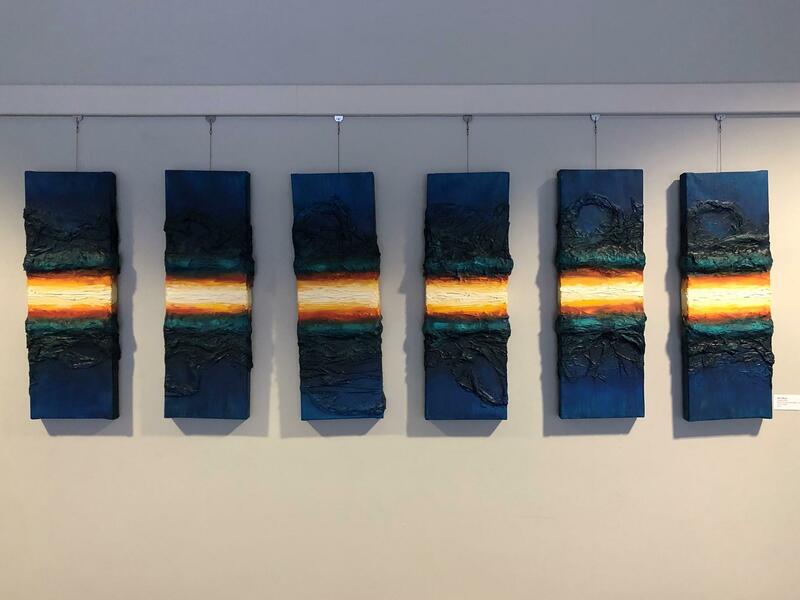 The vertical panels are deep blue, with what the artist calls a "jet stream" of white, orange and red running through a deep crevice in the middle. It looks like a laser beam cutting a trench through an ocean. That trench is built up with layers and layers of plastic bags and oil paint. "This oil took months to dry because it’s so thick on there. It was probably like two months just sitting in my room, drying." The six-panel series 'Eruption' has layers and layers of disused plastic bags and oil paint to create the 'jet stream' running through the center. This is DiRuzza's first non-student show since he graduated from Kent State Stark in December 2017. "Well my journey started when I was little, I was always drawing and stuff. And I discovered abstract art at Kent State. It’s a whole new world of just discovery. Every time you do a different piece it’s exciting and moving and fun." The 28-year-old has been working on the theme of this show since he graduated. "I mean we've already done damage to the planet, and it's unavoidable now. It's just a matter of how much damage. So I think we need to keep communication going and keep hammering this. I'm not really one to go out and speak so I'm just going to use my art to speak for me." When asked what he hopes people take away from his artwork, DiRuzza said it doesn't really matter to him as long as they feel something. With a laugh, DiRuzza points to a painting which someone said looks more like a housecat than anything else. "And I’m cool with that, I don’t care. They see what they want to see, and that’s the beauty of abstract art." Noah DiRuzza’s "Footprints" is on display at the Stark State student center through Feb. 22.